Iran will not negotiate with the West over its presence in the Middle East, says its Supreme Leader. Iran will not negotiate with the West over its presence in the Middle East, the country’s Supreme Leader Ayatollah Ali Khamenei said on Thursday, according to Reuters. His comments came several days after a few days after French Foreign Minister Jean-Yves Le Drian, during a visit to Tehran, echoed U.S. concern about Tehran’s missile program and its influence in the region. “European countries come (to Tehran) and say we want to negotiate with Iran over its presence in the region. It is none of your business. It is our region. Why are you here?” Khamenei was quoted as saying. Khamenei stressed the Islamic Republic would only negotiate on that issue with other states in the region, according to Reuters. Iran’s Revolutionary Guards have sent weapons and thousands of soldiers to Syria to prop up President Bashar Al-Assad in the country’s seven-year-long civil war. Israel has accused Tehran of seeking a permanent military presence in Syria. 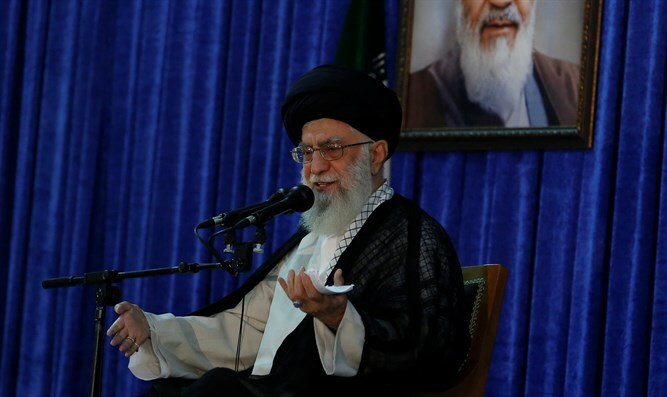 Khamenei described the presence of U.S. military forces in various regions of the world as “malicious and seditious” and said Iran would not ask for permission from Washington to be active in the Middle East. “We will negotiate with America when we want to be present in America,” he said. U.S. President Donald Trump recently decided to extend a waiver on nuclear sanctions that were imposed on Iran, but said it would be the last time he will do so and ordered European allies and Congress to work with him to fix “the disastrous flaws” in the 2015 deal or Washington would withdraw. According to a recent report, the United States has sketched out a path under which three key European allies would simply commit to try to improve the 2015 Iran nuclear deal over time in return for Trump keeping the pact alive by renewing U.S. sanctions relief in May. Also of concern is Iran’s ballistic missile program. The Islamic Republic has several times test-fired ballistic missiles in recent months, raising the ire of the West. This is in addition to the country’s nuclear program which is of great concern as well. President Hassan Rouhani said on Wednesday that Iran’s military might posed no threat to any country in the region. “Our weapons are meant to promote peace, strengthen stability and security and to prevent others from invading our country. No one should be concerned about Iran’s weapons and missiles,” Rouhani claimed, according to Reuters.